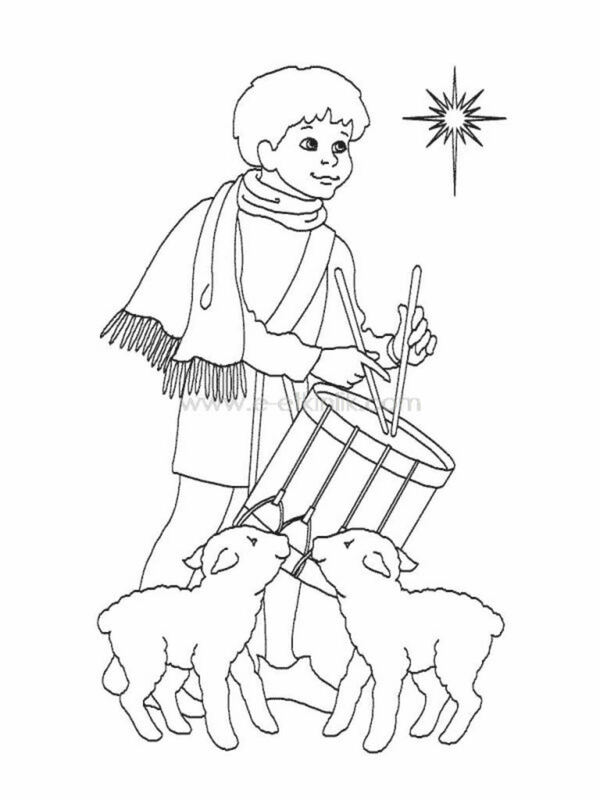 Coloring Pages of "The Little Drummer Boy"
The Little Drummer Boy remains a popular character for those who enjoy a good Christmas yarn, with the little boy who is able to play the drum battling through adversity to end up playing for the Savior Jesus Christ when He is born into the world. Not only has it become a beloved story, but the little boy is a symbol of those searching for hope in a world that has been against them. Most of us can relate to that at one time or another in our lives. That makes for a great lesson to be taught our children or grandchildren, and is made easier by using props such as printables or coloring pages where the children can color in the character or characters connected to the story, while an adult tells the meaning and significance of the story. 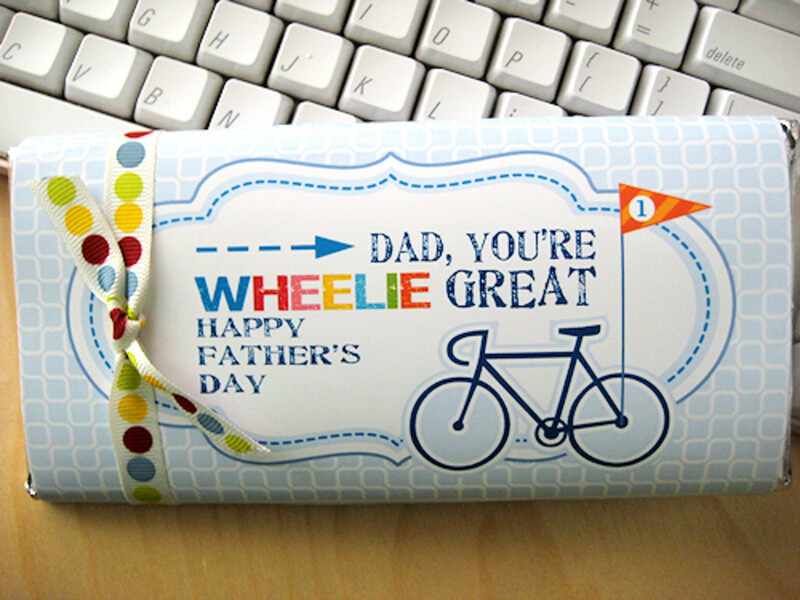 To that end I've put together some printables from around the Internet that can be instantly downloaded and printed out for immediate use by the children, or gathered together ahead of time so they can be presented at the right time for them to interact with. 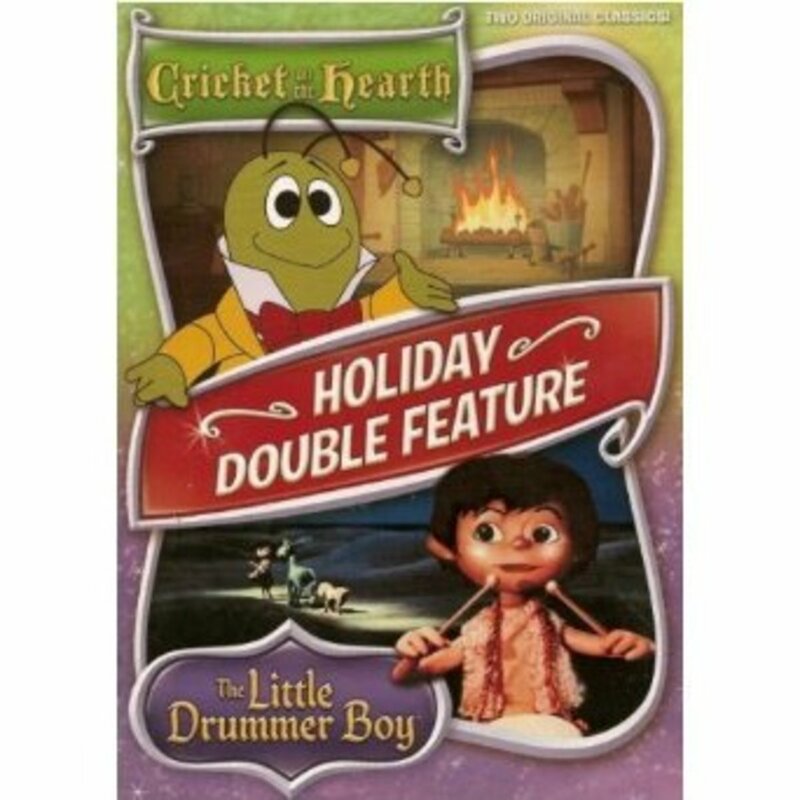 Because he's a child himself, children can relate to the Little Drummer Boy, and in the cases when baby Jesus is included in the image, feel compassion and identify with the overall story where an infant and a child are a big part of the tale. VeggieTales - a well--known brand of Christian story-telling - created their own version of The Little Drummer Boy, which is represented by this wonderful printable of the nativity event as seen through the eyes of the little boy. It's interesting to see the little vegetable characters gazing upon Mary, Joseph and the Baby Jesus as the little drummer plays his tune in honor of the new-born and King of Kings. 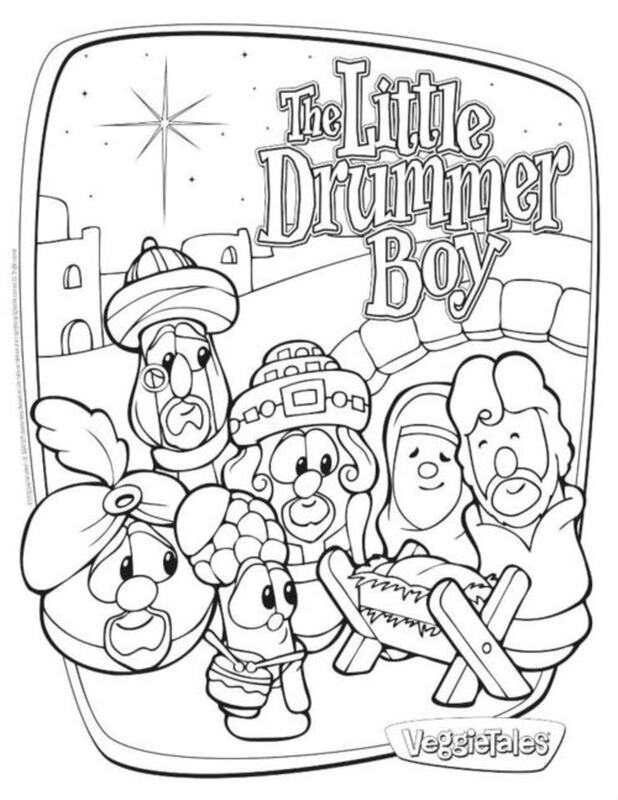 This is actually one of the more detailed and challenging of the printables for the Little Drummer Boy, as it's full of detail and would require a little more age and skill to color in the design. 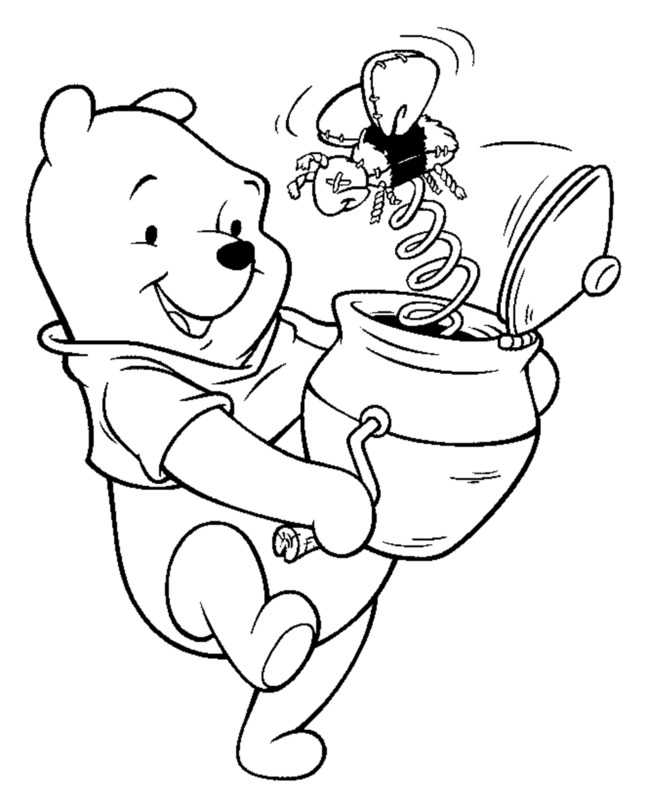 Not to worry though, as there are a number of other coloring pages which would be age-appropriate for younger children. This is a great one for those entering into a higher level of development and who would enjoy the challenge. It's great scene with the Star of Bethlehem in the background and the lettering to offer some creativity for colors that may be chosen to fill them in. 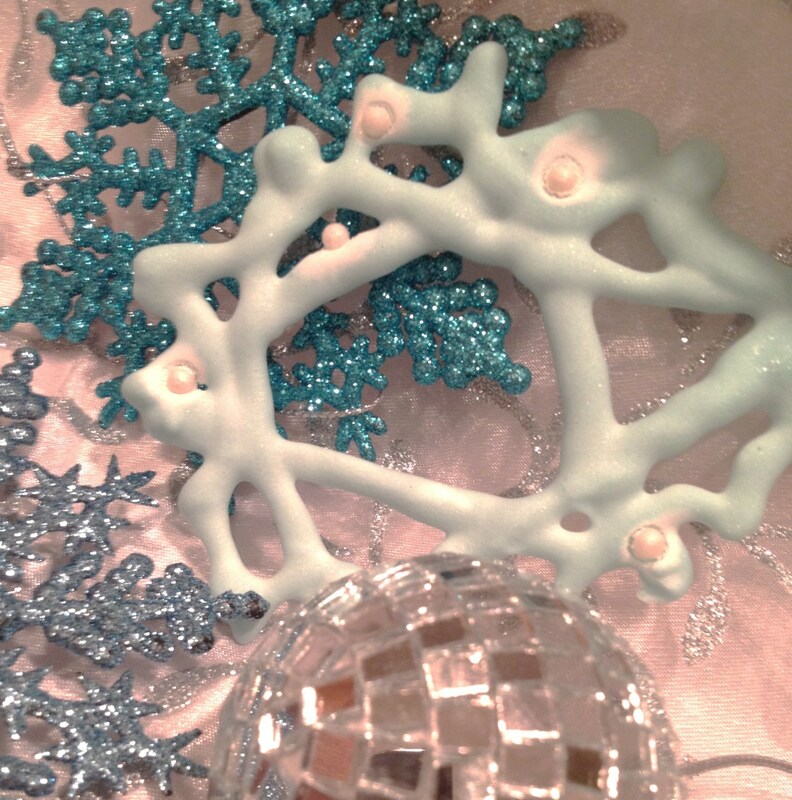 There are only wise men in this nativity scene, which provides for opportunities to be creative with the colors in conjunction with what most of us imagine them wearing when finally finding Jesus. 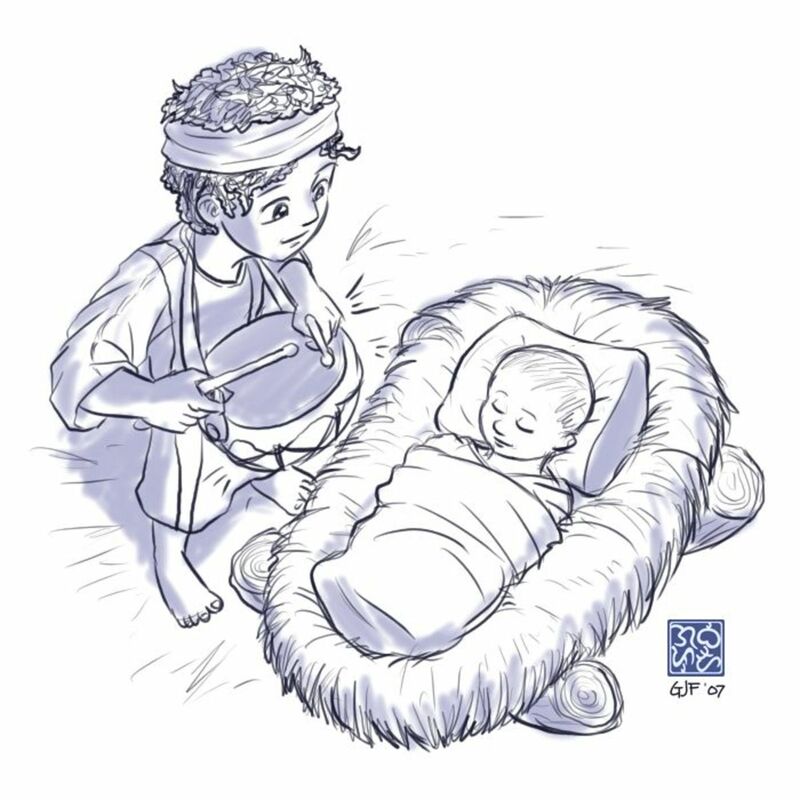 Printables of the Little Drummer Boy come with a variety of scenarios, with the first one of the holy family being the most detailed and including the most characters associated with the historical event. 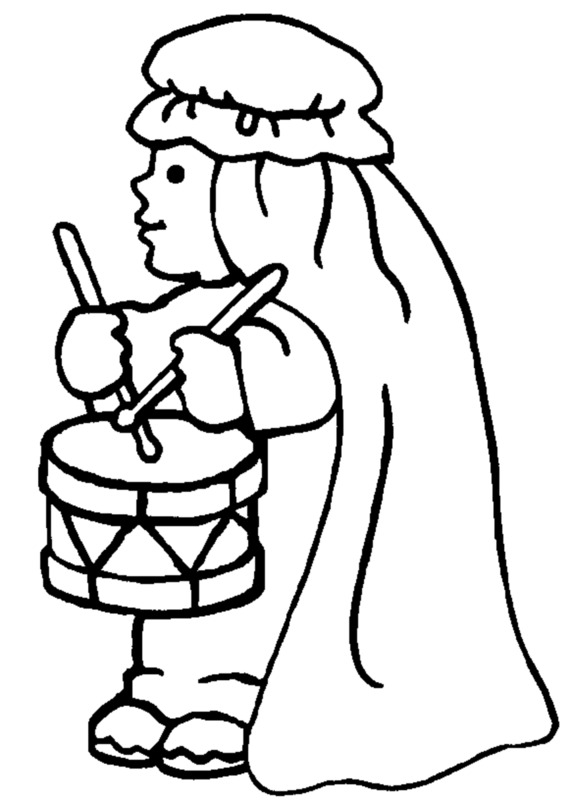 Here we have the Little Drummer Boy himself, which is a nice option for those with children just learning how to draw. As far as sharing the story with children old enough to understand, explaining to them the struggles of the little guy as he goes through his difficult experiences could accompany the focus of this drawing on him individually. Most people familiar with the nativity or birth of Jesus imagine there being certain animals around him because of his being born in a stable and placed in a manger. 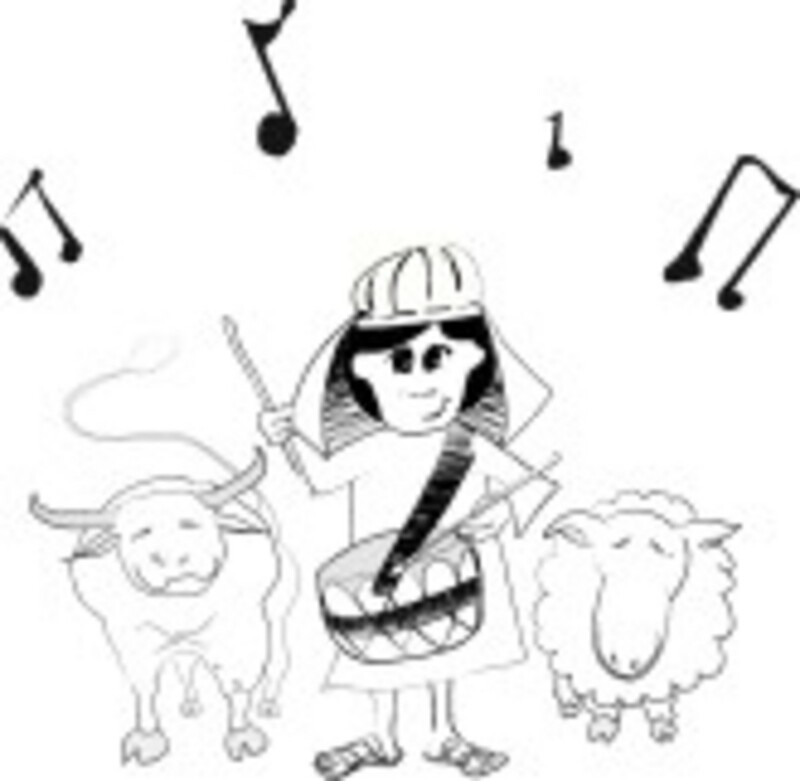 To that end most artists depict cattle or oxen; sheep; or donkeys ... and many times combinations of those domestic animals of some sort, as this printable of the Little Drummer Boy with what appears to be an ox and a lamb. 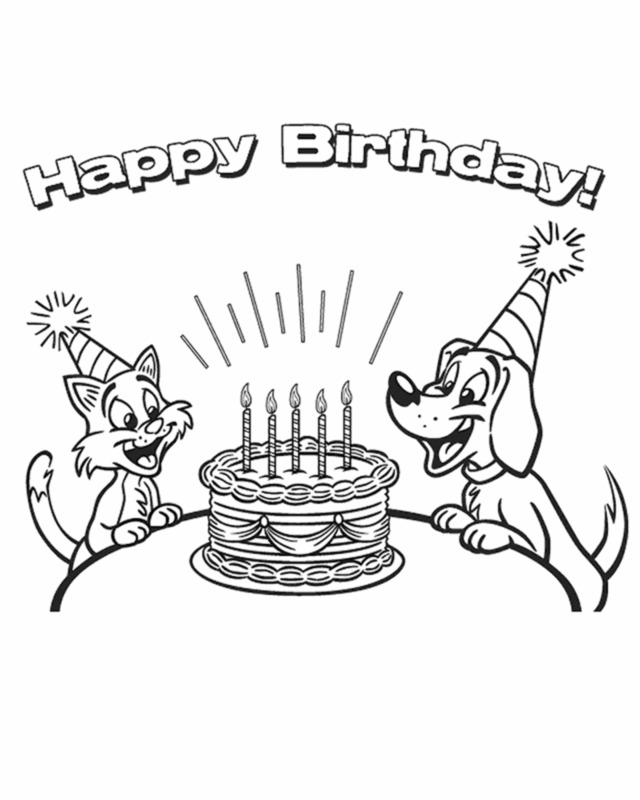 It's a cute image with the animals sure to delight the little ones. Next we have a little different take on the same idea, this time with a couple of little lambs watching the Little Drummer Boy play, with the Star shining in the background. Although it doesn't matter at all as far as using the images to tell the story of what happened so long ago, it is humorous to see in some of these drawings the inclusion of a modern drum design. This printable would be another that would be great for intermediate skill levels. This was a unique printable of the Little Drummer Boy, as the use of shadow isn't something that is included very often. While at first appearance this seems to be a distraction and more difficult to color in, if it is thought of as a guideline for shade places to add darker hue of the color on the shadow areas to generate that effect, it will be appreciated. The only question is whether the shading is too dark to color in with a lighter hue. Of course only adults or older children may even be concerned about that. Younger children will probably like the shadow as part of being a help to their work. It's always a good idea to consider the age of a child when presenting them with coloring pages, and that's the case with these printables of the Little Drummer Boy. Each of those included here pretty much represent a different level, with a couple of them working for younger artists. 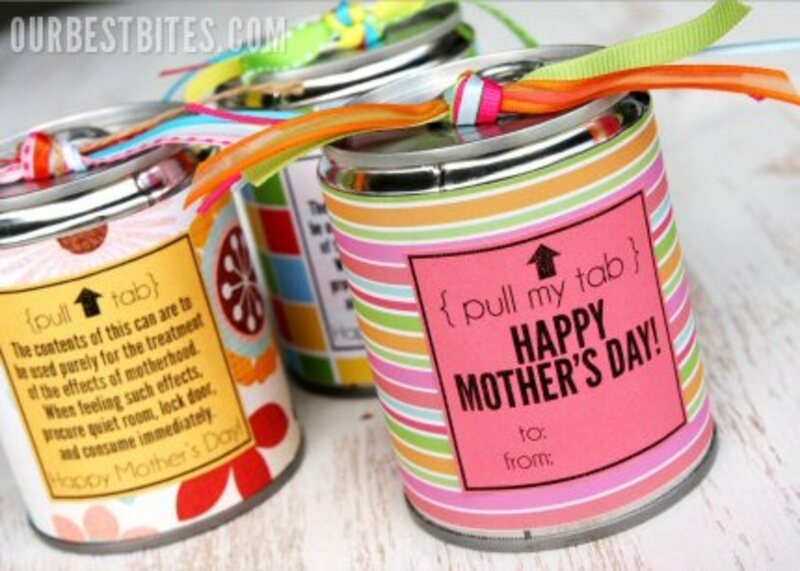 The strength of any printable is that it can be used to tell a story to children which you may want to use to reinforce believes or certain behaviors. And of course many times they're simply great to use as images that can be colored on by children which helps them in developing the more creative side of their personality. Whatever the reason, these are wonderful printables which can be used for any circumstance surrounding the story of the Savior and a Little Drummer Boy that had the privilege of playing his drum for Him.